Earlier this spring a friend and I went on a 6-state road trip throughout the Midwest. After 3 days of rain and a number of foiled plans for our outdoor and national park adventures, we stumbled on to a completely indoor and therefore dry attraction and immediately decided to stay. This was one of the more awesome parts of our trip, partly for the lack of blinding rain, but also because it was just so dang cool. 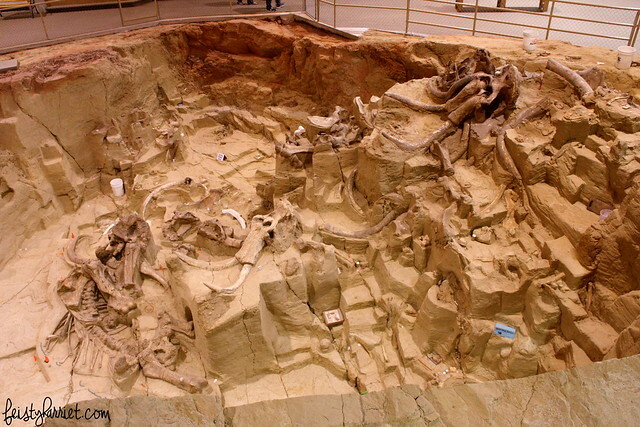 The Mammoth Site of Hot Springs, South Dakota is a live paleontology dig site where scientists are painstakingly excavating bones from dozens of mammoths, both North American Columbian and woolly varieties. The museum is fantastic, the informational video is short and full of interesting facts, and there are a ton of activities for kids. Once upon a time, thousands and thousands of years ago during the Ice Age, there was a sink hole here that was eventually filled with a warm, spring-fed pond with all sorts of delicious, tender plants growing around it. 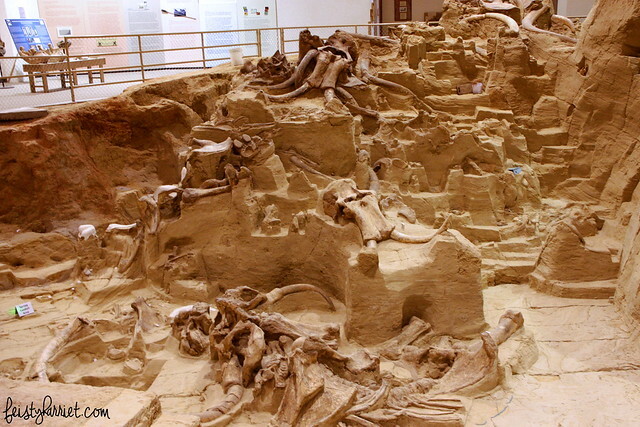 Many, many mammoths (all of them young males, btw) climbed in for a drink, a swim, or a snack and slipped down the steep, shale walls and were unable to ever get back onto dry land. So they starved and/or drowned and settled to the bottom of the pond, only to be covered by more mammoths who were looking for juicy green snacks and a warm bath. Eventually the graveyard-pond filled with dirt and sediment, the spring was diverted, and the bones were preserved in hard-packed mud. 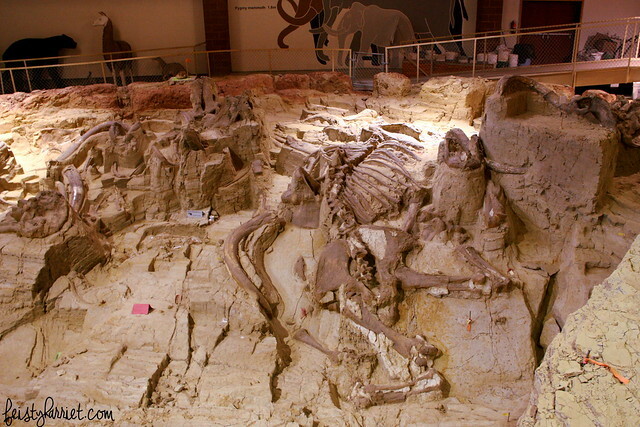 It’s important to mention that these are not fossilized bones, they are very brittle, very dry, and a lot of care and expense has gone in to securing the site and constructing the giant museum over the dig so work can continue year-round without exposing these fragile remains to harsh South Dakota winters (or day and days and days of rain). This is a museum that has been done right, it was so interesting with lots of information and interactive components. 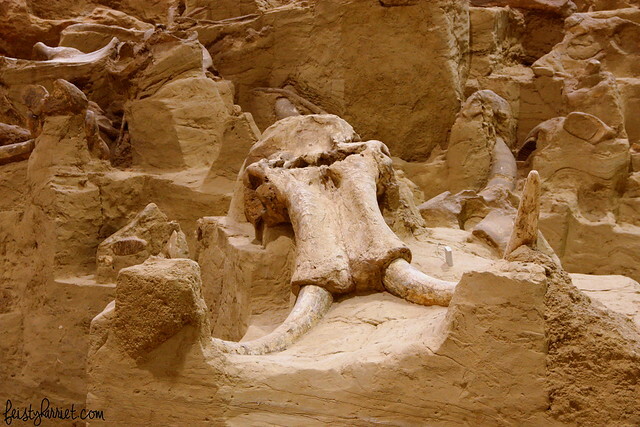 This is a skull of one of the mammoths with tusks intact (doesn’t it look like a giant squid?). Each skeleton is named, the skull above is of the giant Napoleon Bone-Apart (ha! puns!) and one of the best preserved skeletons they’ve uncovered so far. It was so awesome to be able to walk all around the open pit and see the different parts that scientists are working on and studying. Looking down into the pit from the catwalk over the top. It is amazing what they have done in the last 60 years using primarily dental-type tools, dry brushes, and tiny little instruments. As they uncover remains they measure and test and research them, often making molds of the bones to help preserve them. Science is awesome, ya’ll! I’m not gonna lie, my inner geek got all sorts of giddy-excited about this unplanned stop. If you are in western South Dakota I highly recommend spending two hours here. 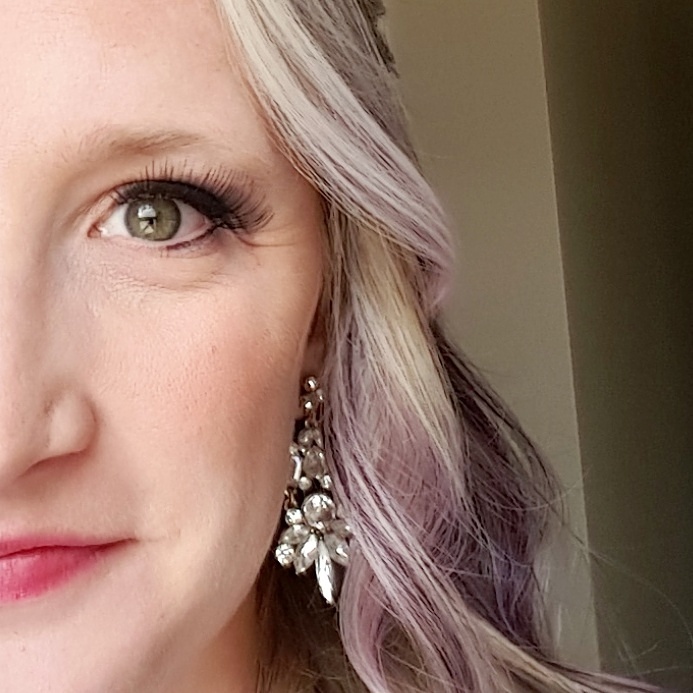 During the summer they have a number of activities where kids and youth can become junior paleontologists and actually do some excavating and digging, more info is on their website. 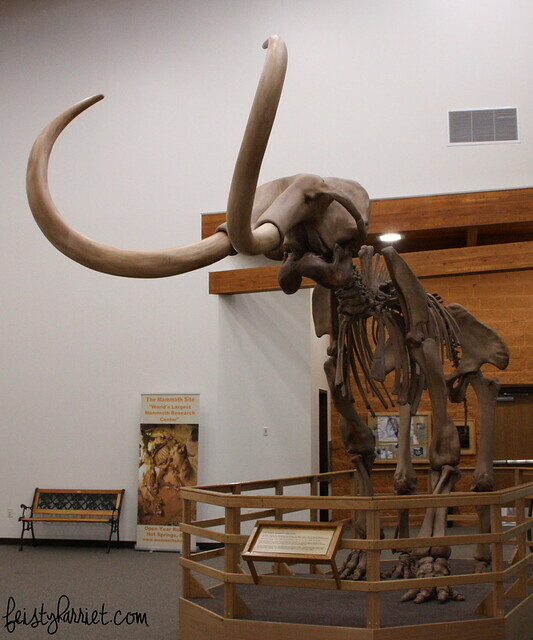 This entry was posted in Far Off Places, Nerdiness and tagged Archeology, Hot Springs South Dakota, Mammoth, Mammoths, Paleontology, South Dakota, Travel, Woolly Mammoths by Feisty Harriet. Bookmark the permalink. OK, this sounds kinda sad! But also looks amazing! Also it’s awesome that even though it’s an ongoing dig of fragile stuff, they let the public in to see. We keep meaning to drive up to Badlands National park (about six hours from Denver)–maybe we can add this to our route! Your kids would love this! They have so many things for little kids to do at the museum! It was EASILY my favorite part of the trip. So. Much. AWESOME! what?? I did not know about this. Very cool.